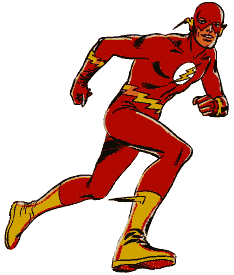 Yesterday’s article about the Flash (warning: major spoilers for this week’s DC Universe: Zero) in the New York Daily News brings up the hero’s key role in launching the Silver Age of Comics. Superheroes had fallen out of favor in the early 1950s, and comics were exploring genres like westerns, horror, romance, etc. When DC successfully relaunched the Flash in 1956, there was an explosion of new super-hero titles. Edit: The comment thread at The Beat also has some interesting speculation on comics without the Silver Age Flash. This entry was posted in Comics, Highlights and tagged Flash, Repost Source, See Also: Speed Force, Silver Age on May 1, 2008 by Kelson.